Today we are talking to Beka, owner of Beka Chandler Massage & Healing. Beka has been serving the valley for four years. 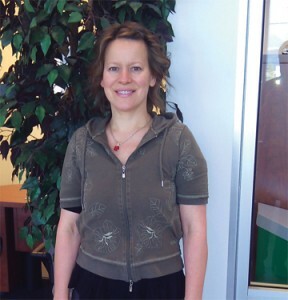 She blends 18 years of clinical massage with 25 years of healing arts practice. She has a business degree, with a minor in theatre from the University of Alaska Fairbanks. Her goal is to create sessions that meet each person’s individual needs. She specializes in deep tissue clearing of old injuries and tension. Beka is well known for her ability to clear trauma in her healing work. She loves to empower people she works with through education on self care made fun and easy. Living with sled dogs with no running water on the mushing trails for 15 years, taught her the power of tenacity and passion in her approach to healing. When did you become interested in Massage Therapy? It was during college. I developed a sore shoulder from the stress of university finals. I tried everything that I knew and nothing would relieve the tension and pain. A friend suggested a massage therapist. After a one-hour session and a simple stretch the therapist showed me, the problem cleared in one day. I was amazed and relieved with how much stress had been alleviated as well. I still do that stretch today. My shoulder has been happy ever since. Where did you receive your massage training? I attended The School of Integrating Shiatsu in Fairbanks, Alaska. The curriculum incorporates both Western and Eastern perspectives creating a unique training of massage therapy. The Western approach to understanding the body is through form, where the science of tissue release is joined with stretch and use of the breath. The Eastern vision of seeing the body is electric, and we learned methods of bringing the energy systems to balance. Combining both styles in my practice allows for releases and alignments to take place, both structurally and energetically. I was really excited about this process, which led me to further my education with other healing modalities. What other healing modalities did you study? As many as I could! I’m a Certified Cranial Sacral Therapist, Hypnotherapist and Therapeutic Yoga Instructor. I also completed training in Neurolinguistic Programming. After I finished a 3-year Hands on Healing program, I became a firm believer in the importance of releasing stagnation and blockages in our physical and emotional body. How do you find these areas of stagnation in the body? Stagnation can be located in the muscles, meridians or within the nervous system. I feel as if my hands are drawn to these areas like a magnet. An OSF actor once said, “Wow, I think you have eyeballs on your fingertips because you automatically go right to the source.” My massage school teacher stressed the importance of developing our intuition. She felt that using intuition is 90% of what makes a great therapist. I feel a combination of my intuition and education enables me do this. What inspired you to move from Alaska to Ashland? I was looking to relocate to an artistic town for my daughter and myself. I’ve always been a huge fan of live theater and my daughter is very much into different expressions of art. When I learned how much Ashland had to offer, I knew it was the perfect fit for both of us. Since our arrival almost five years ago, I’ve been to every play each season and each experience has been amazing! I work at Southern Oregon Sports and Spine here in Ashland. When Marc Heller and Matt Terreri offered me to be part of their clinic, I was beyond thrilled at the opportunity. Marc and Matt have extensive clinical training, so for each of them to resonate and feel strongly about my ability really made me feel proud of the work I had done. I also have a private studio located near downtown in the Railroad District. Was it a difficult transition moving from Alaska to Ashland? Marc, Matt and the Ashland community were my saving grace. From the moment I landed here, I connected with so many incredible people, and I know that helped me feel more comfortable with my decision. I was also really drawn to Marc and Matt’s clinic from the beginning. After they offered me the position, I remember being in the parking lot crying. The tears were full of gratitude and relief since I really wasn’t sure how I was going to support my daughter and myself. I was scared to leave a thriving 15-year practice of clinical and intuitive healing massage in Fairbanks, Alaska. It felt as if I was pulling up 40 years of roots in my hometown and moving away from family, friends and all the stability that comes with that. So the decision to move was also a leap of faith? Yes, a big one. I had to walk my talk and follow what I felt so strongly to be an inner wisdom speaking to me. So whether it is a leap of faith, following your heart, listening to your intuition, or all of the above, it was the core motivation of my decision to move to Ashland. What were your goals when you first started practicing? From the start, I wanted to create a valuable experience for anybody who walked through the door. My focus is to make improvement and noticeable change during our sessions. I work with a wide range of clients, so this process can vary from one person to the next as well as from session to session. For instance, one client may be a wrestler who needs very deep muscle tissue work and rehab, the next person may have been in a rollover car accident and need cranial sacral and trauma released from their nervous system. Luckily, many great healers and teachers have been there for me to learn from and help me develop my own system of approach. A good therapist will let you lead the session. You live in your body, so you know more than the rest of us about how it is feeling. Intuition is a must for me when I look for doctors, chiropractors, etc. Intuition goes right to the source of a problem. For me, having logic and intuition is like having both your oars in the water. It is the only way to move forward in life. You should always feel better after a session. If you don’t, keep looking until you find the right therapist for you. When I moved to southern Oregon, I made it a point to meet many healthcare practitioners. I enjoy helping people connect and am a good resource for referrals. I love doing detail work. Many of my clients are musicians and massage therapists. They come to keep their hands and thumb muscles free of stagnation. Hand muscles are very small. The beauty of muscles is they are like chewing gum, so look for the hard spots, work on them, and they will become more elastic allowing for the tension to clear. Having an 18-year full time clinical practice has given me a lot of experience. I really love challenging cases. Helping people with head injuries, migraines and whiplash is very rewarding for me. I was born in Alaska and got to study with both Eskimo and Native Alaskan Indian healers. I feel like the Alaska wilderness, living without running water for 15 years in cabins and the wild sled dogs are a part of my energy work. A client brought his visiting mother in who recently had facial surgery. Half of her face was swollen, painful and healing slowly. I did cranial work to release one of her skull plates, and energy work to release a traumatized nerve. Trigger point therapy helped to release face muscles and I ended with a gentle facial massage. After a few days, she looked like herself again. Every session brings a brand new experience. What is the latest thing you’ve included into your work? My voice teacher installed a bar above my massage table while I was on a trip to Bhutan, Northern India and Dubai. It was very surprising to find areas hidden deep in people’s leg muscles that I had worked on before. Standing on the table and holding the bar helps me clear the large trigger points in legs that are pulling clients low backs and alignment off. How do you know your clients are having a breakthrough? When they share an awareness they’ve had or a change in their lifestyle since our session. For instance, they may decide to change their diet, or maybe give themselves permission to rest more, it can really vary. When you can hear that they are loving themselves and treating their body better, you know these clients are starting to enjoy life more. It is really exciting to witness. Yes both personal and automobile. If you are injured in a car accident your insurance will cover your treatment. When I was in a car accident, the first thing I did was go to a doctor. He said I would be sore for a few months. I was too young to know to get my muscles checked by a massage therapist and my joints checked by a good chiropractor. Injuries that sit in your body can cause problems later. I am happy to do billing for people. If you could teach people one thing, what would it be? How to ground themselves to keep their energy flowing and release stress out of their system. Teaching people how to eat and move to feel better is also incredibly rewarding. How did you learn to be efficient? When I worked with the Alaska Smokejumpers in Fairbanks, I learned to be very fast at clearing multiple injuries. Sometimes they came in for a one-hour session with an injury. The next day they could be at the jump shack getting on a plane to another fire out in the bush. They may be out there for months, so I learned to give each session everything I could. I was born in Fairbanks, Alaska, the sled dog capital of the world. I did a lot of sled dog rescue and lived without running water for years on the dog trails. Skijoring is when you take sled dogs and connect them to a climbing harness. I had five dogs and they slept in the cabin with me. I would take three at a time and go skiing in the mountains. A friend would take the other two. One night it was a full moon, with northern lights and the comet Hale bob was in the sky, it was magic. I love skijoring. My daughter is the musher. She has been mushing since she was three. I will be doing some talks at the Food Coop starting this summer. One will be “How to Find/Be an Enlivening Partner”. The other wellness talk will be “A Better Feeling Body”. Everyone wants to feel good. I try to make health education fun and easy. My new passion is my travel blog. I will be starting a health blog soon. A book would be the next step in my career. I am working with our amazing guide, Sonom to take a group to Bhutan. You can reach Beka Chandler at (541) 778-0015. You can email her at bekachandler77(((at)))gmail.com.